This was the week of the BC storm a series of 3 storms the last one to be the most significant. The last one wasn't as strong as expected and where I was there was not much of an effect. I was going to go across the border with my best friends family on Saturday. We cancelled on Friday after my friend got stuck in traffic for hours because of accidents. I was lucky and mostly did not notice anything different than normal as I started my day later. I did notice when I was in downtown Vancouver on Friday that it was much windier there than it was in my city of Coquitlam. Last week was small business week and Small Business BC offered a few of their normally paid seminars for free. I have taken a few courses in the past there and love what they offer. If you are a small business or thinking of starting one they have a large amount of resources available and many for free. On Monday I attended the how to start your consulting business seminar. Although I already run a consulting business it is currently a side project. I am planning to make it a full-time venture in the future. The speaker was very knowledgeable and I picked up many tips. On Friday I attended the building your own starter website with wordpress seminar. It was the first time the speaker had done a seminar. 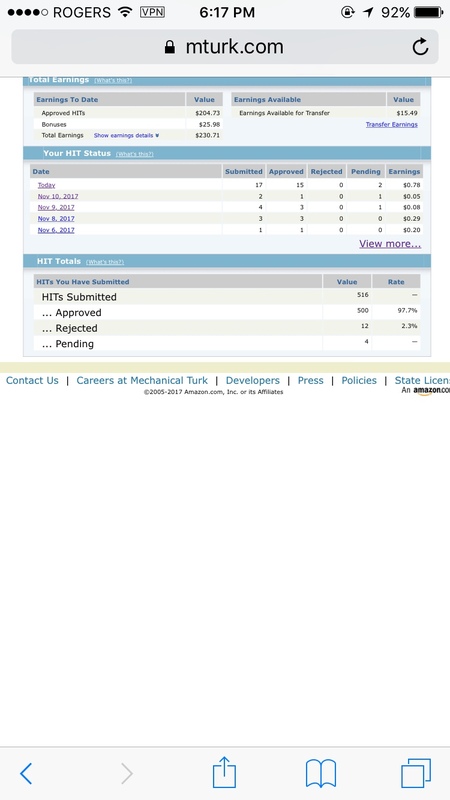 He did a great job and I now understand what themes and plugins are in wordpress. I am hoping that will help me to move my blog over to livingvancouverloca.com If it's live next week then it was all thanks to that seminar. I highly recommend checking out what Small Business BC has to offer http://smallbusinessbc.ca if you are in Vancouver they are located right inside waterfront station so very convenient. Due to the storm warnings my plans involved more of staying in my apartment than usual so had time to do things at home. 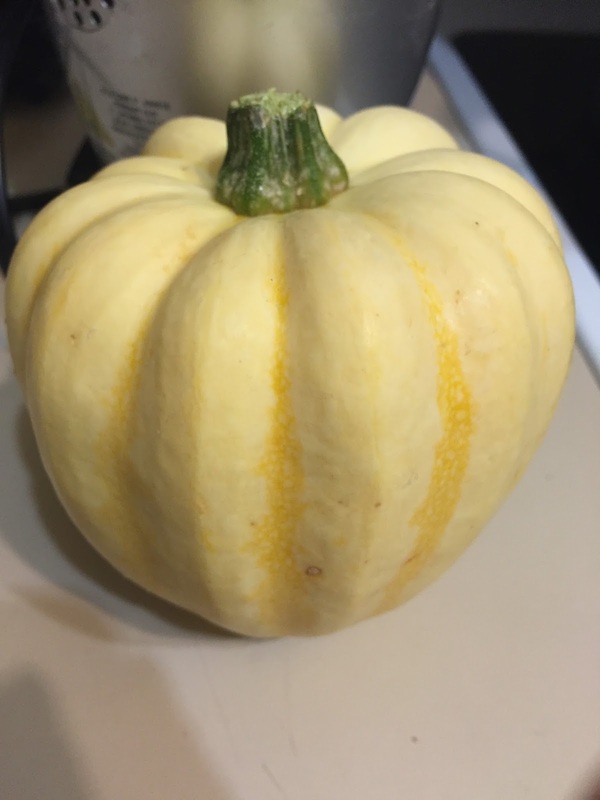 My brother had picked this squash from the garden at my mom's house and left it for me. I don't know what kind of a squash it is and I am not that familiar with squash varieties. It has been on my counter for a week while I tried to figure out what to do with it. My dad used to grow spaghetti squash in the garden now that he has passed my brother has taken over the garden and replaced the crops. 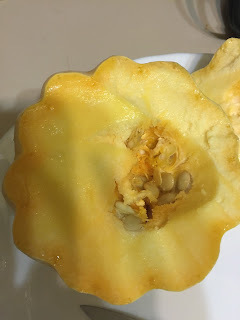 I wasn't sure if this squash is sweet or bitter and wasn't sure how to cook it. The spaghetti squash was always good if I roasted it. 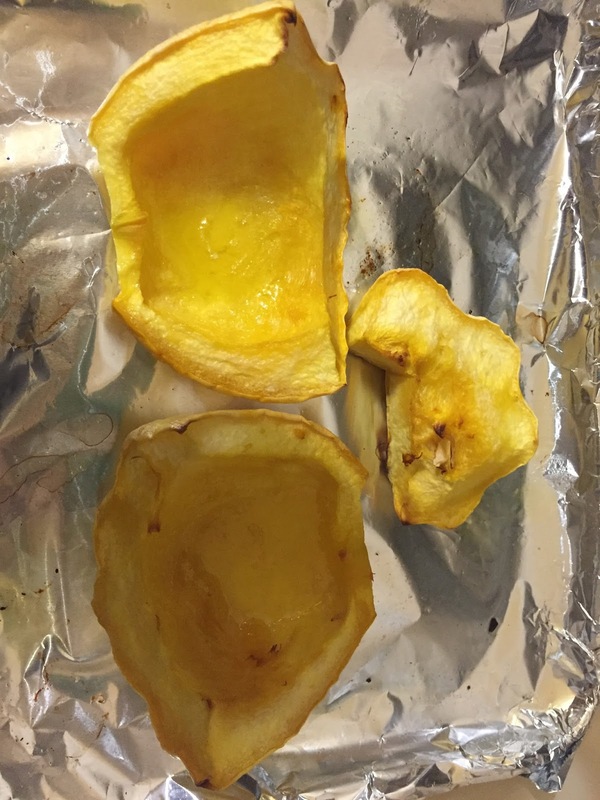 My mom told me she had roasted this squash and it was good. I cut the top off and noticed there was a lot of seeds on just one side. I scooped the seeds out and cut it in half. Then I spread ghee on it. 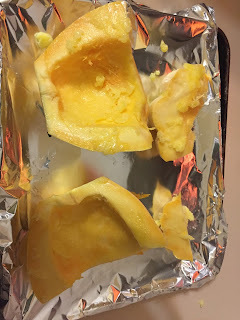 Ghee is butter with the milk solids removed. leaving clarified butter. I use it as my main cooking fat now as it is healthier than butter but still tastes like butter. I then put it in my toaster oven for 20 minutes at 400 degrees. It needed another 20 minutes after that. I was hoping it would be sweet because I wanted to eat it for dessert. It was very good I just ate the whole thing plain it did have a sweetness to it. I tried to google what kind of squash it was I thought my brother told me it was a buttercup but that doesn't match google's picture. It kind of looks like a yellow acorn squash. I am still not sure but next time I go to the garden I will find out and pick some more to eat.